Outside of perhaps power metal, no metal subgenre has given me as many fits trying to enjoy as grindcore. Don't get me wrong, I can get down with some grind from time to time; it's punishing speed and ferocity can be just the ticket, and obviously bands like Pig Destroyer, Napalm Death, and Dying Fetus are legendary figures within the metal world. But I just don't seem to find myself sitting down after a long day and saying "You know what Durf? You should listen to some Brutal Truth right now." And it's for a silly reason: time. As a general rule, grind songs don't break the three minute mark, and that's on the short side of what I like my metal to be. I like to get lost in the music, and it's just really hard for me to do that when your song is 45 seconds long, and a lot of grind is that short, ipso facto, I don't listen to a lot of it. But then one day a few years back Mick introduced me to an album called Abandon All Life by a band called Nails. And I loved it. The whole thing was maybe 25 minutes long, but I was enthralled, so much so I actually went back and looked at which sub-1:00 snippet was which song. It really wasn't until Abandon All Life that I was able to go back and listen to Pig Destroyer's Book Burner or Dying Fetus' Destroy the Opposition and actually enjoy what I was hearing. It was a game changer. 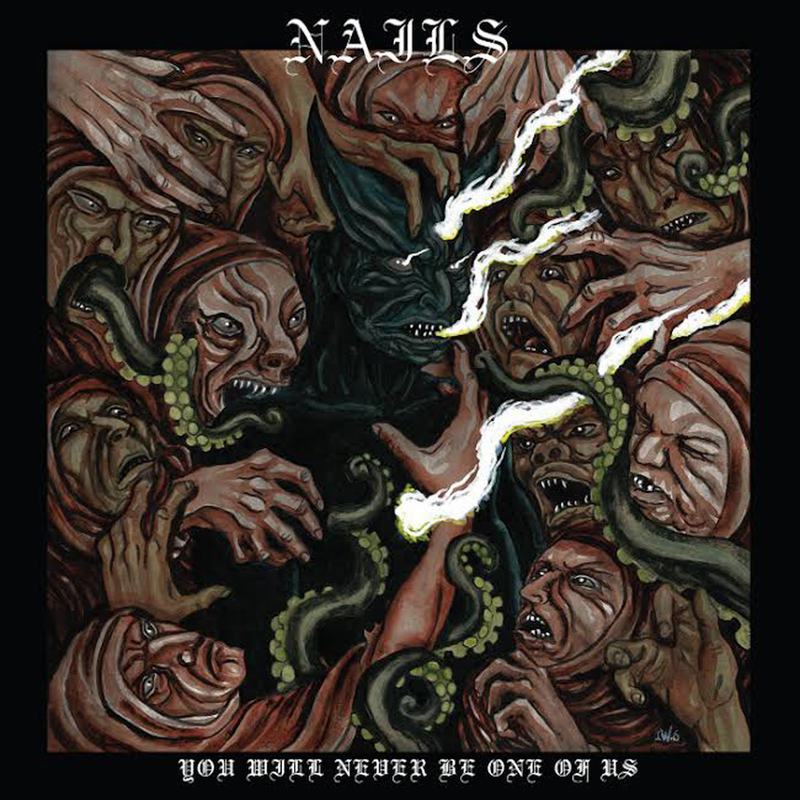 And now three years later, Nails returns with You Will Never Be One of Us. You Will Never Be One of Us kicks off with the title track, which opens with multiple voices saying "You Will Never Be One of Us" over swirling feedback before the music fires up like a kick to the teeth, blast beats and screaming guitars and vocalist Todd Jones' absolutely devastating roars. A minute and a half later, "Friend to All" somehow kicks things up a notch in intensity, while also featuring an amazing tonal change about halfway through that gives drummer Taylor Young his moment in the sun. Until the last track, "Violence is Forever" is the only song that cracks the two minute mark, and it is easily the best "long" song on the record. "Into Quietus" manages to slow the band's frantic pace down (relatively) from a whiplash-inducing frenzy to a perfectly headbangable pace. Ironically, "They Come Crawling Back," the album's eight minute closer, is my least favorite song on the track. It could just be a result of the song taking up half of the album's runtime, but after the urgency of the first nine tracks, "They Come Crawling Back" seems to drag a bit, never quite reaching the soaring heights of the album's other songs. Despite the title, You Will Never Be One of Us is an incredibly accessible record, especially coming from a genre I've had a hard time with. 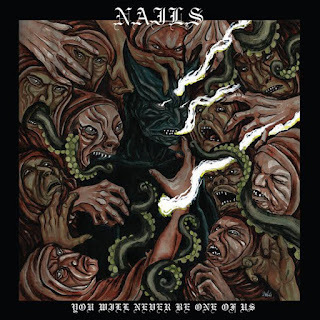 Nails continues to exemplify all the things I love about grind - namely, making it a faster, filthier version of death metal - while simultaneously helping me make peace with the things I don't (song lengths). It says a lot for me when the forty-six seconds of aural destruction on "Friend to All" is just as great and enthralling to me as, say, the ten and a half minutes of Cough's "Shadow of the Torturer." I owed Nails a debt of gratitude for Abandon All Life helping me understand grind, and now I owe them another one; I know that I'm new to the genre, but You Will Never Be One of Us is undoubtedly my favorite grind album I've encountered, a frantic slab of riffs and anger that just keeps plugging away and establishes Nails as a force to be reckoned with in the metal landscape.